Ambode: The War Against Him Is Not Yet Over? Governor Akinwunmi Ambode could be down in weeks. LANRE ADEWOLE points out his options. He got an alternative offer when the clouds began gathering. At a meeting of the Governor’s Advisory Council (GAC) which usually holds in the Bourdillion home of his now-adversarial godfather, Bola Tinubu, the governor was offered senatorial ticket for Lagos East, in exchange for a drop-out from the governorship primaries, so that he would not walk away empty-handed. Ambode declined the offer. Another unconfirmed report says there were also other soft-landing propositions, but he would not go down quietly and without a fight. He fought and lost, and despite a humiliating surrender, feelers from the political circles in the state, suggest the battle isn’t over for him. Though he allegedly surrendered and agreed to walk away after the completion of his single term, in order to stave off possible impeachment by the House of Assembly which is committed to seeing his back, the skies over him, are reportedly not as whiter and clearer as he would have desired, to have a smooth sail to May 29. Tribune checks showed that the unabated moves to terminate his tenure before the next year general election, are still as alive as when the battle to stop his second term began. Two conclusions are reportedly driving the renewed agitation by hawks in the camp of his embittered godfather, to fire him, through impeachment. It was learnt that his association with the factional state executive council headed by Lagos politics strongman, Fouad Oki, during the struggle for the party ticket with the new candidate Jide Sanwo-Olu, didn’t go down well with the other side, though in the thick of the contest, Sanwo-Olu too, through his campaign Director-General, Tayo Ayinde, sought cooperation from the same leading factional elements like Oki and Muiz Banire, the immediate past National Legal Adviser of the party. The governor’s concession could also be deemed to be too ‘easy’ for comfort. In some circles, it is being viewed as a bait for his traducers to let down their guard, considering the sweat and blood that went into the gruelling ticket duel. “The thinking is that as long as he has access to state funds, he can do a lot of damage” a source reasoned. 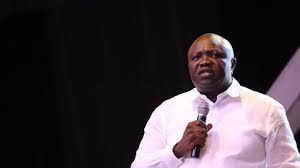 Ambode can be said to be a victim of his lack of tact when the going was good between him and his godfather, with the outgoing governor said to always be willing to take up any semblance of battle his godfather was facing then, regardless of whether the owner of the battle, wanted to fight or not. Most of the non-aligned political enemies he made, Tribune was told, were from battles that had nothing to do with him but his godfather, who is now waging same war against him. A few days back, a political enemy of the governor told a Tribune source that he long foresaw his pitiable end, but that not many took him serious then. Having helped his godfather fight his battles beyond what the owner envisaged when they were chummy together, sources on both sides, refused to dismiss the possibility that the governor’s enemies would never believe he was ready to walk away peaceably until they walk him away, on their terms. “Akin (Governor Ambode) will have to take his own the way it has come. But I can tell you their (his traducers) own too will come” a bigwig who is neutral in the fight, told Sunday Tribune on Thursday. The State House of Assembly had publicly denied considering impeaching the governor and many political watchers in the state, doubted if the Tinubu camp would go for what would seem an overkill, but Sunday Tribune findings showed that the Bourdillion group isn’t leaving anything to chance. For the state executive that dumped the governor for Tinubu, mum has been the password since Ambode was muscled out of the race. Getting any of the officials to speak on the future of the governor in the party, is like getting the dumb to pronounce the longest word in the dictionary. The refusal to comment could actually mean not knowing, but even those who know aren’t talking. Tribune was told by a top party analyst that President Muhammadu Buhari, regardless of how Ambode ends in Lagos, could make him a big threat to Tinubu in 2019 by offering him a ministerial position that would make his adversaries in Lagos, green with envy. This possibility is reasoned as the most likely possibility the governor would not be thrown out before May 29. The Babatunde Fashola experience must still be fresh in the minds of members of the Tinubu camp. Though he, leading other South-West rebels, could not dislodge Tinubu and his own in Osun and at least in Lagos, for now, the BRF gang did substantial damage to Tinubu’s political interests in Ondo and Ekiti States. And since it doesn’t look like Buhari would be dumping BRF anytime soon, the combination of both, Fashola and Ambode as ex-governors, could be too devastating for the Lagos Lords. An associate of the man who would soon be governor, Sanwo-Olu told Sunday Tribune that the Tinubu camp was very mindful of what Buhari could and would likely do to possibly undermine Tinubu, after winning the second and final term in office, especially with the way the party’s National Leader rebuffed both his direct and emissaries’ pleas, to allow Ambode a second term in office. Tinubu’s alleged involvement in the crises rocking Imo, Ondo and Ogun primaries in which his men are having the upper hand, particularly in Ogun State where Governor Ibikunle Amosun, Buhari’s closest ally in the South-West, had been given a bloodied nose, is also said not to be going unnoticed by the president. A party enthusiast says Tinubu should be worried that Buhari persuaded his closest ally, Amosun, to allow Tinubu have a runaway victory in his backyard. The worried source said the president was allowing Tinubu to make a lot of enemies for himself in his backyard to get him toasted, an easy job, after the 2019 poll. “He can’t continue rubbishing this president without Abuja fighting at the appropriate time. If he (Tinubu) wanted to impeach Ambode, the president despite his warm disposition towards the governor, can even tell the governor to resign and walk away. But there is no way, there won’t be a blow back. The form is what is not known now” the party source said. Months before Sanwo-Olu was eventually unveiled as Bourdillion choice, some political calculations were made known to Tribune. Three persons were said to have been locked in a tense meeting with Tinubu at his home. Two of them were well-known billionaires and the third an influential lobbyist. A proposal from Tinubu reportedly went to one of them to replace Ambode on the party’s ticket. He reasoned that as a bosom friend of the governor, he should not be seen reaping from his ‘misfortune’. Seyi, Tinubu’s son, was reportedly tipped as the billionaire’s running mate. There were no commitments. Suddenly, the billionaire friend was heavily linked with another governorship project. It was taken to be Ambode’s agenda. By the time, corruption allegations were flying against the godfather, the governor was pointedly accused of being battle ready. The second billionaire friend of the governor, who was also at the said meeting, met a party chieftain from Lagos in Abuja recently and complained that “people like you, turned one man to what he is today” referring to Tinubu and his total institutional control of the state. Now, that his governor-friend has been disgraced, the question is if he too, will join in the fight to demolish the godfather, despite their relationship too? But the more critical issue is if the governor himself is willing to fight, at least, to end the dominance of his erstwhile godfather. His friend is no longer in contention for any major ticket, but the suspicion lingers that he might get into anti-candidate mode like others before him, who are beefing with the godfather. Will Ambode, acknowledged, as the captain of the class of current governors, turn a rebel, to undermine at least in Lagos, the platform that made him? Every eye is trained on Lagos, as Nigerians await the gladiators’ next moves ahead of 2019.